Like most NC State University students, Ben Alig pays close attention to time management. After all, he juggles classes for a double major in poultry science and agricultural business management with extracurricular activities that include Alpha Gamma Rho and the Poultry Science Club. And then there are the 25 to 50 hours a week that he spends running his own small company. At his Wake Forest-based Little Birdie Hatchery, Alig selects breeds of chickens to sell, meets licensing requirements, administers vaccines, fights pests, and handles marketing and social media. He cares for each chirping baby chick, be it Ameracauna, Buff Orpington, Cuckoo Maran or Buff Laced Polish. During the spring busy season, he might sell 250 birds in a week. Alig’s studies have advanced the operation, which he started at age 11, and private support has helped fuel the NC State junior’s entrepreneurial dreams. The recipient of three merit awards – the H. Connor Kennett, W.F. and Mozelle Parker and Fred Tarver Poultry Products scholarships – based on his performance at NC State, Alig entered the university as a sophomore through the Student Transfer Enrollment Advising and Mentoring program (STEAM). STEAM was created in 2013 as part of the College of Agriculture and Life Sciences’ multipronged Farm to Philanthropy effort. Initiated by a gift from Joe and Debbie Gordon and supported by additional donors, the program expands access to the university. Students are invited to apply for STEAM based on academic profile and genuine interest in agriculture; teachers, extension or 4-H agents and others can recommend them, and many hail from rural areas. Participants spend their freshman year at another institution and are guaranteed transfer admission to NC State if they meet performance standards. There are 35 STEAM students on campus, with the first cohort set to graduate this year. Twenty-eight have been accepted into the fourth and most recent class and are now enrolled as freshmen in North Carolina community colleges and other institutions. “STEAM offers an incredible opportunity to invited students who are passionate about agriculture and willing to work hard,” said Kimber Lunsford, program coordinator. Alig did well in high school and thought he had a solid chance at NC State admittance. He remembers getting STEAM information in the same envelope with his deferral letter. Alig took two classes at NC State the summer after high school graduation, then spent two semesters at Wake Technical Community College proving himself with a 3.7 grade-point average. STEAM participants complete the college’s required orientation course together. Along with extra advising, they enjoy regular social and academic gatherings before and after enrollment at NC State, building friendships and connections. “There’s definitely a community,” Alig said. As for the incubator and brooder battery literally in his own backyard, the hatchery business – which includes a permanent flock of about two dozen adult chickens – got its start when Alig, his parents and two siblings moved from Raleigh to a more rural area of Wake County. His mother had long been intrigued by owning a few chickens. They bought five. Young Ben, reading and learning everything he could get his hands on, started caring for them as part of earning allowance. He wrote a business plan to make a few thousand dollars a year that included walking dogs, cutting grass and investing birthday money to build chicken tractors and buy a coop. He soon shifted gears toward selling birds to families wanting their own small flocks. Alig bought 30 chicks, raised them and sold almost all on CraigsList within three days. From there, the enterprise quickly grew beyond his expectations. During his junior year in high school, Alig started thinking more about his future path when he and his father, Mike – who studied poultry science at NC State before embarking on a career in veterinary pharmaceutical sales – teamed with other students to start an FFA chapter at St. Thomas More Academy. Ben credits the school with showing him the value of melding practical and classical education, as well as the need for leadership and entrepreneurship in the agriculture sector to meet varied world food needs. He knew the best place to pursue his interests was nearby. It took him a bit longer to get here, but he is now happily learning to raise poultry more efficiently. A course about meat birds helped him improve his baby chick feed. 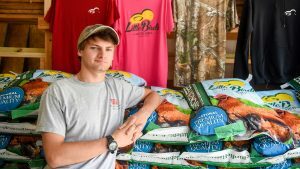 A feed milling class taught him to run tests on his Little Birdie Hatchery-branded feed, milled by a Johnston County firm. (In addition to chicks, Alig sells basic chicken-care supplies.) A classmate has helped design graphics for stickers, T-shirts, hats and other logo items, which a Wake Forest store produces. Alig maintains a stable customer base in the greater Triangle, with some sales across a broader area. He has plans for growing Little Birdie Hatchery, although he is keeping several career options open. He is thankful for donors to NC State and hopes people understand the impact they can make on students’ lives – both through financial support and through advice and mentoring. Thirty-nine students who received the Chancellor's Study Abroad Scholarship this year participated in semester-long and summer programs in 15 different countries. They recently spoke of the transformative effect their study abroad experiences had on their collegiate and personal lives at the annual celebratory reception for the scholarship, funded by gifts to the University’s Greatest Needs Fund. Monica RIchmond, a senior in the College of Agriculture and Life Sciences, is involved in several privately-supported initiatives on campus, including the University Honors Program. See how Monica spends her day as a senior in CALS.